There has been a recent call to action by the Mayor’s Alliance in an effort to save a colony of feral cats from starvation or, worse, poisoning. 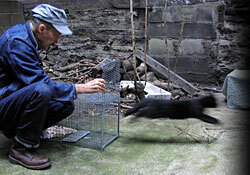 The cats have been living on the property at St. James Church in Manhattan, where caretakers have been feeding and monitoring them in accordance with TNR protocol. In recent weeks, however, the resident priests have locked caretakers out, and refuse to meet with the Mayor’s Alliance to discuss a mutually beneficial course of action. Please take a moment to read the story on Out of the Cage! where you can learn more and contact church officials to voice your concern. It’s that time of year again! This weekend (December 17 and 18) the Mayor’s Alliance for New York City’s Animals will be hosting their second Whiskers in Wonderland adoption extravaganza. In addition to cats, dogs, rabbits, and exotic pet adoptions there will be a pet psychic, a poker-playing Yorkie, pet fashion and so much more! Stop by the Metropolitan Pavillion at 125 West 18th street between noon and six p.m. on either day to check out the festivities. A few months ago we attended a fun event called Architects for Animals, hosted by the Switzer Group and the Feral Cat Initiative. 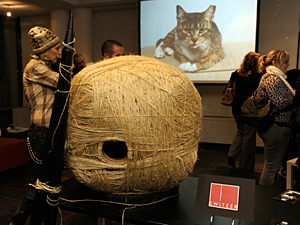 You can now view a slide show of the event and the stylish shelters designed for, and donated to, New York’s feral cats.